KNOXVILLE, Tenn. September 15, 2016 – Stacy Cox, architect and design expert and principal of Studio Four Design, a top architecture and design firm based in Knoxville, Tennessee that specializes in worship facilities, will speak at WFX, Worship Facilities Conference and Expo, at the Kentucky Exposition Center, on September 21-22, 2016. Cox will be presenting “Design Matters! How Design Can Influence Your Ministry” on Wednesday, September 21 at 4:30 p.m., in room SWB107. He will share how to identify and assess some of the barriers current worship facilities may have and how to transform and enhance a church’s platform for ministry. Cox’s professional experience includes more than 20 years in architecture and design, with a church facility portfolio that ranges from master planning and small renovations up to new construction projects in excess of $5 million. Along with his role as president and managing partner of Studio Four Design, Cox is actively involved in his local church and with several ministries in Haiti. Joining Cox in delivering the presentation will be Bobby Thompson, student pastor at Knoxville’s Grace Baptist Church and a Louisville, Kentucky native. The Worship Facilities Conference and Expo (WFX) is two and half days of education, hands-on training, networking, inspiration and exposure for every ministry team, including worship, tech, facilities and administration. It is the largest dedicated church expo in the United States, with opportunities to research and discuss hundreds of products and services all in one place. For more information about WFX 2016, visit http://wfxweb.com/2016/. For more information about Studio Four Design, visit http://studiofourdesign.com or see them at booth No. 640 at WFX 2016. Published on September 15, 2016 by Ripley PR. 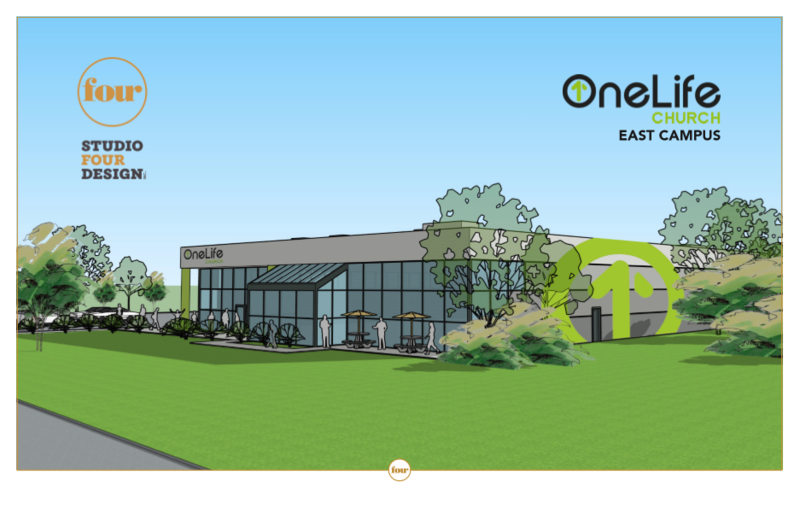 KNOXVILLE, Tenn. September 8, 2016 – Studio Four Design, a top architecture and design firm, has developed plans for the renovation of the new OneLife Church campus, located at the entrance of the Knoxville Center mall. Formerly a Just for Feet building, the 19,000 square foot facility sat vacant for 12 years before finally being purchased this month by OneLife Church. OneLife Church currently has two Knoxville campuses, one in Powell and the other in Halls that Studio Four Design has provided design services for. Because of their growth over the past few years, the OneLife Church Halls campus will be relocated to the new Knoxville Center location. Renovations on the Knoxville Center campus are expected to start immediately with an anticipated grand opening date set in December. The church is also in the early planning stages for a future West Knoxville campus. Published on September 8, 2016 by Ripley PR.